Are You Asking God This Question? The Lord spoke to John when he was in the wilderness and told him what to do (Luke 3:2). Then John walked his sandals to the dusty country trails around the Jordan and got himself busy for Jesus. He preached what the Bible calls “a baptism of repentance” for the forgiveness of sins, and he challenged the people of Israel to live lives that produced fruit in keeping with repentance. (Luke 3:3,8) His message was two-fold, but simple: turn from sin and turn toward God. The people wanted John to help them understand. They wanted to know what that should look like in their lives. That same question was shouted from people of different backgrounds, careers, ages, and responsibilities … from people with different challenges and different experiences. What should we do? John answered them. And in doing so he painted a picture of what it should look like for every follower of Jesus to produce fruit in keeping with repentance. Look at what he said. The Bible goes on to say that John spent time with the people, exhorted them, and told them the good news that God had sent him to share. (Luke 3:18) As I consider the illustrations that John used to describe what a fruit-producing life looks like, I reflect. Am I asking God that question? What should I do, Lord? Thankful for this fresh heart-burden, I decide to summarize what John told the people and apply the principles to my life. This is not an exhaustive list by any means, but it is a great starting point. (Especially for a New Year.) Here are the things that John said we should do in order to be fruit-bearers. #1. Share – Live beyond yourself and your stuff. Be generous. #2. Be honest – Do your job. Don’t take what’s not yours, and tell the truth. #3. Live with integrity – Don't do what you shouldn’t do, even if you can, and treat others well. #4. Be content – Stop reaching and straining for stuff that doesn’t really matter in light of eternity. Be thankful for what you have. As I look over this list, I wonder. What changes can I make in the way I do things that will produce more fruit? How willing am I to share? Am I honest? Who am I when others aren’t looking? Do my choices honor God? Am I content? James 2:14-26 says that faith without deeds is dead. I want my life to give evidence of faith – to shout the fame of Jesus, just like John the Baptist. I want to be a woman who produces fruit in keeping with repentance … fruit that bears evidence of my turning from sin toward God. Yes. Yes. Yes! So I determine that this list is a great place to start. Dear Lord, Thank You for your Word that is rich with lessons. Please help me to be a woman who does things that will cause others to see You. Help me to share, be honest, live with integrity and be content. Which of these four fruit-bearing principles is tugging on your heart today? Tell me about it in the comments section of my latest Instagram posttoday. Portions of today’s devotion are an excerpt from Gwen Smith’s book, I Want It ALL. If you struggle with an anxious heart, this is for you! 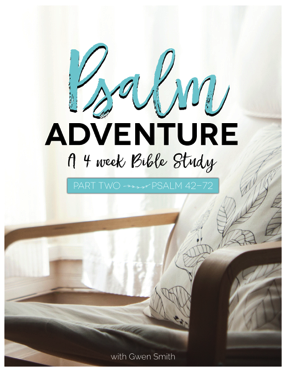 Girlfriends in God cofounder Gwen Smith is hosting a FREE online Bible Study, a PSALM ADVENTURE, Part 2, beginning January 14th. We’ve gotten countless messages asking how you can know what God says about forgiveness, healing, fear, depression, finances, relationships and hope. You want to know and trust God more, and learn how to connect your personal struggles to His promises.